Chinese military and aeronautic equipment exhibited at the air show in Zhuhai, South China's Guangdong Province, has increasingly attracted attention from international buyers. The 12th China International Aviation and Aerospace Exhibition 2018, also known as Airshow China 2018, kicked off on Tuesday in Zhuhai. This year's exhibition has more international buyers on opening day than the previous show, several arms producers said. 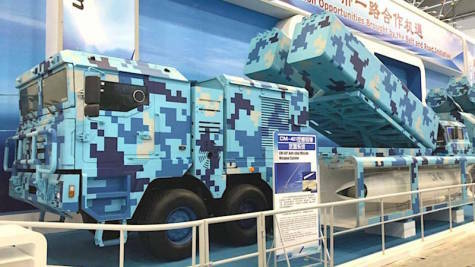 Some of the military equipment which received the most attention from international buyers are the CM-400AKG and CM-401 missiles, Zhu Andong, a staff member of the China Aerospace Science and Industry Corporation, told the Global Times on Tuesday. The CM-400AKG air-to-ground missile is a supersonic missile meant to strike buildings and radar sites. The CM-401 is a high supersonic ballistic anti-ship missile mainly used to attack medium-to-large-sized ships. Those products are increasingly appealing to buyers from other countries due to their high performance-to-price ratio, Zhu said. One of the other best-selling items at the air show is the Rainbow series of unmanned aerial vehicles (UAVs), Wang Yongzhi, the technical expert of the Rainbow series, told the Global Times on Tuesday. He said that the UAVs have attracted more attention from international buyers in this year's exhibition. Wang said aside from almost all of the previous buyers during the last air show, the Rainbow series has also attracted new foreign consumers on the opening day of this year's exhibition. The Rainbow series was developed by China Aerospace Science and Technology Corporation (CASC). A statement released by CASC on Tuesday said the company signed 32 cooperation agreements worth 45.3 billion yuan ($6.6 billion) on the opening day. Over 100 Chinese and foreign entrepreneurs participated in the signing ceremony, the statement said.